TOKYO - Nikon Corporation is pleased to announce the release of the AW120 designed for shooting in everyday situations and outdoors with advanced functions and performance such situations demand. 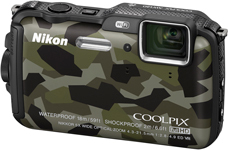 The AW120 is the successor to Nikon's waterproof, shockproof, and cold-proof COOLPIX AW110. This new camera offers even better basic performance than its predecessor, and functions supporting outdoor use have also been improved. It is equipped with a 5x zoom lens beginning at the wide-angle 24mm focal length and offering a fast maximum aperture of f/2.8. This enables sharp rendering of images with shooting in dark or dimly lit situations, such as underwater, indoors, or with night landscapes. It is also equipped with five-axis vibration reduction that effectively suppresses the effects of camera shake with movie recording. It offers tough performance for worry-free use in hard-core outdoor situations with waterproofing to depths of approximately 18 meters, shockproofing that withstands falls from up to approximately two meters, and cold-proofing that withstands temperatures as low as approximately -10°C. It is also equipped with a variety of functions that support an active outdoor life, including a built-in world map, functions for acquiring location data from GPS and GLONASS satellites, and functions that display altitude, water depth, atmospheric pressure, and water pressure in the camera monitor. The built-in Wi-Fi® function can be used to transfer photos* to a smart device over a wireless connection as soon as they are taken. The camera is available in four colors: camouflage pattern, orange, black, and blue. Adoption of a design that is both tough and fashionable makes it the perfect compact digital camera for use not only with outdoor activities, but with everyday use around town as well. The AW120 is equipped with a 5x zoom lens beginning at the wide-angle 24mm focal length and offering a fast maximum aperture of f/2.8. The lens also supports macro photography with shooting as close as 1 cm to the lens. In addition, it is equipped with Dynamic Fine Zoom, which enables approximately 10x zoom with which resolution is preserved in the digital zoom range. The AW120 is waterproof to depths of approximately 18 m, the maximum depth allowed for those with a diving license*. What's more, in addition to shock-proofing that withstands falls from approximately 2 m and cold-proofing to approximately -10°C, the camera's tough body is also designed to resist dust and sand for fun, worry-free use with both leisure activities and hard-core outdoor activities. *With open water license, a diving license recognized around the world. In addition to support for the GPS system available with its predecessor, the AW120 offers support for the GLONASS* system, making positioning faster and more accurate. More precise location data (latitude and longitude) can be recorded with images, even when shooting in locations in which positioning was previously difficult, such as between buildings. *Satellite navigation system that uses Russian satellites. The AW120 supports display of points of interest (POI) for adding the names of places where photos are taken to images captured with the camera. In addition, location data acquired with the high-performance GPS/GLONASS function, along with the direction in which the camera is pointed recorded using the built-in electronic compass, can also be recorded with images and displayed on a world map in the camera monitor. Shooting locations (up to 30) can now be registered with the camera using the Save Location option with map display. 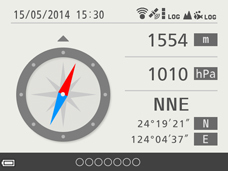 In addition, information necessary with outdoor use can be confirmed with a quick glance at the monitor display by pressing the map button in shooting mode, or by holding down the map button when the camera is turned off. 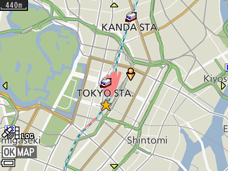 When the map is displayed, users can zoom in or out on the map by shaking it, or scroll over the map by tilting the camera. The AW120 is also equipped with other functions that make operating it in outdoor situations convenient, such as while wearing gloves that make pressing buttons difficult, including a function that displays a round compass when the camera lens is pointed downward. Adoption of a pressure sensor enables display of altitude and water depth*, as well as atmospheric and water pressure, in the camera monitor. What's more, this information can be added to images with shooting. Users can also retrace memories of outdoor activities using a log function that records altitude and depth at regular intervals and displays them on a graph. *With Underwater scene mode, and when the camera automatically recognizes that it is under water in Easy Auto mode. The AW120 is equipped with a five-axis vibration reduction function that combines lens-shift vibration reduction with electronic vibration reduction with movie recording. Five-axis vibration reduction combines lens-shift vibration reduction, which compensates for camera shake in the form of slight tilting to the left and right or forward and back, with electronic vibration reduction, which compensates for camera shake in the form of slight movement to the left and right, up and down, or in a somewhat circular motion up and down and left and right, for effective vibration reduction under a wide variety of circumstances, such as when recording movies while walking. This enables beautiful rendering of images with which blur caused by camera shake is effectively suppressed with shooting in outdoor situations where camera shake often occurs. In addition, smooth 1920 x 1080/60i movies with superior picture quality and stereo sound can easily be recorded by simply pressing the movie-record button. The AW120 also offers functions for creating movie files that contain only necessary or desired portions. There is a function that allows users to intermittently pause and restart recording of a single movie, and another that allows users to save only the desired portion of a movie as a separate file. There are also advanced functions, such as Face Priority, with which the camera automatically recognizes, and focuses on, human faces. With built-in Wi-Fi®, the wireless transfer of images to smart devices* such as smartphones and tablets is possible. The number of steps required to apply Wi-Fi® settings have been reduced for simpler image transfer. Smart devices can also be used to take pictures remotely, zoom in or out, and enable the self-timer, capabilities that are convenient when taking group photos in which the user is included. *The Wireless Mobile Utility app must first be installed on the smart device (the app can be downloaded free of charge from the smart device's app store). The AW120 is available in four colors: camouflage pattern, orange, black, and blue. Its unique, elegant design is more refined, yet is tough enough to stand up to harsh conditions, making it well suited not only to use outdoors, but also to everyday use around town.